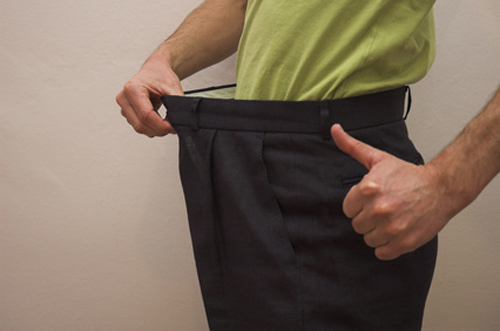 Close up on slimmed down male waistline wearing old trousers and thumbs up to demonstrate pleasure at weight loss. FDA action date for phentermine-topiramate combo is set for late October. Treatment with Qnexa®, Vivus’ registrational anti-obesity drug, allowed patients to lose an average of 11.4% of their initial body weight and significantly improved weight-related co-morbidities such as hypertension, dyslipidemia, and diabetes, according to top-line data from a year-long extension to the Phase III Conquer study. An NDA for Qnexa was filed in 2009, and the FDA action date has been set for October 28. In July, however, FDA’s endocrinologic and metabolic drug advisory committee voted against its approval, reportedly out of concerns about psychiatric side effects. Since then the same panel has recommended that the FDA not sanction Arena Pharmaceuticals and Eisai’s obesity therapy, lorcaserin. They also suggested that the labeling on Abbott’s approved treatment, Meridia, be changed to reflect the potential for cardiovascular side effects and to restrict its use to certain subgroups of overweight and obese people. Vivus’ latest trial data has emerged from the placebo-controlled Sequel study, an extension arm involving 675 obese or overweight patients who had completed the original 56-week Conquer study. All patients had at least two weight-related co-morbidities and an average baseline BMI of 36.1. Vivus says the results from Sequel showed that patients taking the highest dose of Qnexa achieved and maintained an average weight loss of 26 pounds over the two years. Among those patients without diabetes at baseline, Qnexa therapy was also associated with a 56-74% reduction in the incidence of new onset of type 2 diabetes, compared with placebo therapy. Qnexa is a once-daily, oral, controlled-release formulation of low-dose phentermine and topiramate, which Vivus claims act in combination to decrease appetite and increase satiety. The drug is separately in Phase II development for the treatment of type 2 diabetes and obstructive sleep apnea. Three pivotal Phase III trials evaluating Qnexa in over 4,500 patients as a treatment for obesity have been completed under an FDA Special Protocol Assessment. The Equate study evaluated 756 obese patients over 28 weeks at 32 sites. Equip and Conquer were both 56-week studies; Equip evaluated the drug in 1,267 morbidly obese patients with or without co-morbidities, and Conquer included 2,487 overweight and obese patients with at least two co-morbid conditions. Vivus says estimates suggest that over one-third of the U.S. adult population is obese, equating to some 72 million people. The figure for obesity worldwide is estimated to be about 400 million individuals. The firm further claims that beyond its impact on health, obesity economically accounts for 9.1% of U.S. annual healthcare spending, or about $150 billion. Moreover, if trends in the escalating rates of obesity continue, by 2030 obesity-related healthcare costs could reach $956 billion, accounting for up to 18% of total healthcare costs, or $1 in every $6 spent on healthcare.